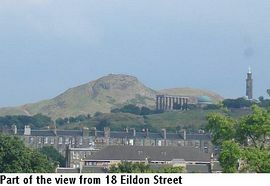 Our Victorian family home enjoys a stunning out look over the city skyline, from Arthur's Seat on the left to Edinburgh Castle on the right, with all main monuments in between. 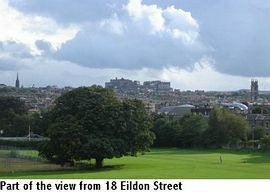 Eildon Street is a quiet cul-de-sac off Inverleith Row, near the East Gate of the Royal Botanic Garden. 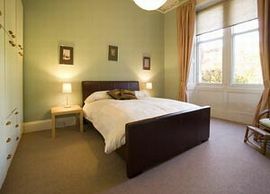 Princes Street is only 15 minutes walking distance away. 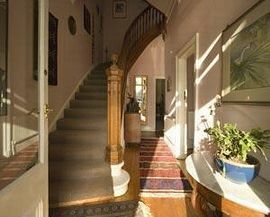 18 Eildon Street is a traditional Victorian stone building on three floors; the ground floor can be used independently as a self-contained flat for short stays. In our ground floor, South-facing lounge, there are lots of books, cable TV, DVD player, and a sideboard with tea/coffee-making facilities. Our spacious dining room faces the garden. The Victorian (gas) fireplace provides extra comfort in winter. Near the East Gate of the Royal Botanic Garden. Pet Facilities: Pets are not allowed. No Pets. Smoking Facilities: Smoking is not allowed. All places in Scotland are smoke free. 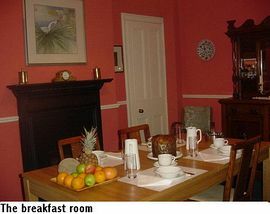 Rates vary from £70.00 to £100.00 for a double room.